Since 2012, Henry Ford Allegiance Health in Jackson, MI has used Medicom Health assessments. They enjoyed decent results, but wanted our help with a low cost way to generate even more completions. Specifically, they believed better targeting and messaging alignment could reduce HRA drop-off. We agreed. In our experience, when properly tuned and targeted, Facebook campaigns engage patients better than almost any other single method for HRA participation. Especially for mobile. To help our clients best leverage Facebook for HRA promotions, we created our SocialConnect service. We focus only on HRA promotion. Thus, we have optimized a methodology for efficient conversion. No one knows HRAs better than we do. After 5 years of promoting HRAs through their website, social media, direct mail and other traditional means, Henry Ford Allegiance Health decided to try Medicom’s SocialConnect platform. Did Facebook Campaigns Engage Patients? Over the course of a yearlong campaign, we made adjustments to ad copy, images, and targeting, based on our ongoing analysis. We carefully monitored and tweaked the promotions so that the Henry Ford Allegiance Health team could dedicate time to other strategic initiatives. Nearly 30% of HRA completions included High Risk results with recommendations for further treatment. In many cases this led to office visits, lab work, scans, and in some cases surgery. Note: In order to be diligent with dollars, campaigns were limited to Breast, Heart, Knee & Hip and Lung HRAs. 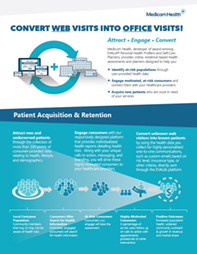 Because of the low cost for SocialConnect, Henry Ford Allegiance Health has been able to continue implementing the strategy to drive traffic for billable encounters. ABOUT: Henry Ford Allegiance Health is a 475-bed health system in Jackson, MI. Henry Ford Allegiance Health is one of six hospitals in the Henry Ford Health System (HFHS) headquartered in Detroit, Michigan. Combining hospital-based care with a full range of services, Henry Ford Allegiance Health serves all members of our community. They complement traditional acute care services with mission-based services to support the care continuum for all members of the community. Through the Health Improvement Organization, HFAH is also a national leader in forming community partnerships that innovatively address wellness and prevention needs in the community.